We specialise in renovating older properties and bring our insulation expertise to each renovation which can make an old house like new. We deal with the three main issues which must be considered when renovating your home; insulation, air tightness and ventilation. We offer a complete package of construction services for homeowners and commercial properties. We bring our level of expertise to the various stages of renovation and construction. We can provide a consultation service and go through all of your options to provide the expert advice you require, which would be tailor-made for your needs. Renovation incentives are available through Revenue.ie: The Home Renovation Incentive (HRI) Scheme allows you to claim tax relief of repairs, renovations or improvements to work completed in your main home or rental property which was subject to 13.5% Vat. optimised renovation solutions, tailor-made just for you. Insulex provides a complete package of renovation services for homeowners and commercial properties. Backed by our proven Project Management System our experts have successfully renovated hundreds of properties and reduced energy bills. We offer a one stop solution to renovation/construction projects of all sizes. We specialise in renovating old buildings to modern standards and will work alongside you to create a design solution to meet your renovation needs. Whether it’s creating more space in your home or redesigning rooms for better use. We can provide all renovation services from start to finish. Insulex can talk through all of your options and provide expert advice and optimised renovation solutions, tailor-made just for you. Insulex is one of the most experienced conservation specialists in Ireland; working on projects in the public, commercial and domestic sector as a principal contractor or specialist sub-contractor. We have experience in solving structural problems, sourcing of materials and working with conservation personnel. We design structural solutions for the care and repair of any historic buildings. We specialise in redesigning existing buildings, creating a home to better suit your needs. There are a range of building adaptations which can be completed to your home. The extent of which depends on the purpose of these adaptations; Modernisation, Conversion or Maintenance etc. Insulex offer our expertise in every aspect of building adaptation. A housing adaptation grant is available from your local council under the Mobility Aids Grant Scheme; Housing Aid for Older People Scheme. We have worked with a number of people whom have received the Mobility Aid Grant which assists those who require necessary upgrades or adaptations to their home. We would design adaptations that suits the client’s needs. Where changes need to be made to a home to make it more suitable for a person with a mobility issue. These grants have to be applied directly by you to your local council. Should you decide to go ahead with this work, we can provide necessary quotations for your grant application. We would design adaptations that both suit your requirements and meet the necessary regulations. It is possible to extend without planning permission, we can design extension solutions that adhere to the planning limits which would make an extension exempt from planning permission. We are SEAI approved and can bring our insulation expertise to every aspect of your build. Insulex can talk through all of your options and provide expert advice and extension solutions, tailor-made just for you. To balance insulation and airtightness in your home, it is worth considering controlling the airflow within your home. Air tightness will stop warm air from leaking out and allow for a ventilation system to operate efficiently. Once air tightness has been addressed, ventilation is very important, especially in older buildings. It is important to install a ventilation system that will provide the correct quantity of air to the house as a whole. Heat Recovery Ventilation System is an economical energy recovery ventilations system. Heat Recovery Ventilation changes the air in your home with the use of recovered heat to warm any incoming air. Air to Water Heat Pumps extract energy from the air outside and transfers this energy or heat which can then be used to heat your house. Insulex can go through all of your ventilation options and provide expert advice and solutions, tailor-made just for you. Planning and design is essential to ensure that the building will work for you now and in the future. We listen to your requirements to create a vision to meet these needs. We can provide planning and design on every level from a new build to an extension or renovating a section of your home. We offer varying design solutions tailor made to suit your requirements. Insulex have a team of experienced professionals who will help you with the initial process of advising you on creating your dream home. Getting the correct advice prior to beginning a project will save you time, money and stress; whether it is a small re-design, a conversion or a new build. Correct advice prior to beginning works will realise the full potential of your home. Insulex will help you create a list of requirements for your home. We will help you envision the full potential that can be achieved. We will factor in advice on external and internal features to consider when considering a redesign of your home. We will bring our insulation experience to help you design an energy efficient solution to your home. 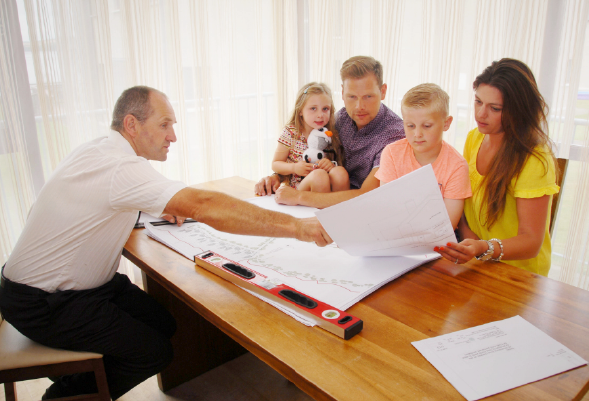 Advice from pre-plans to finish – help you find a balance between your requirements, your design and your budget.